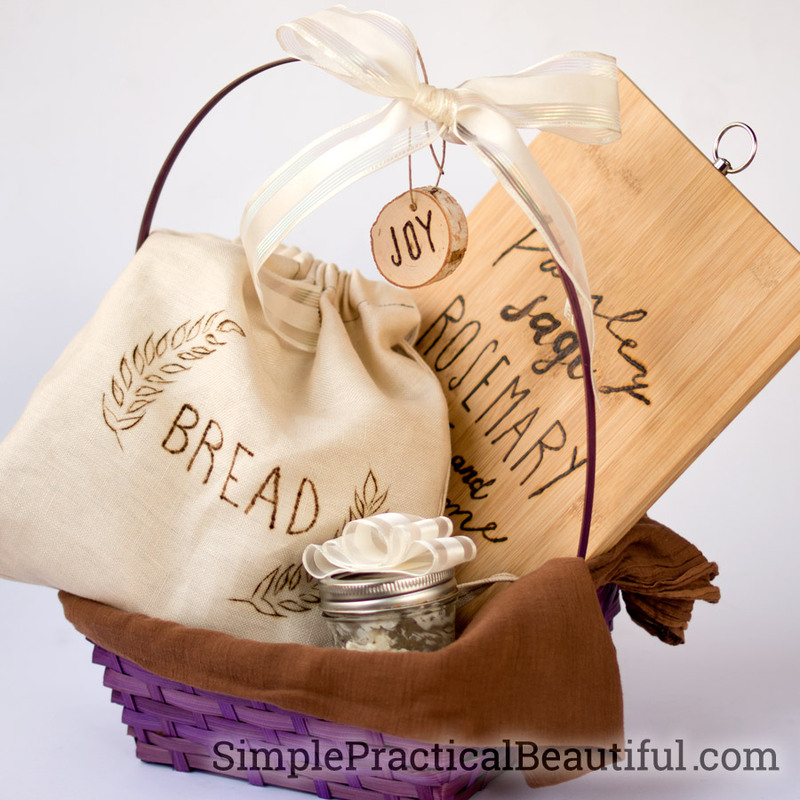 Give a fresh bread gift basket with a cutting board and bread bag. 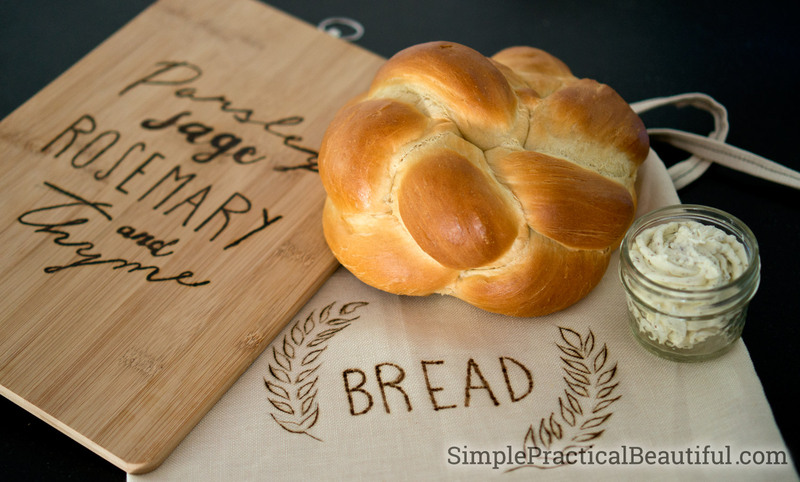 Use a wood burning tool to decorate and customize the cutting board and the linen bread bag. 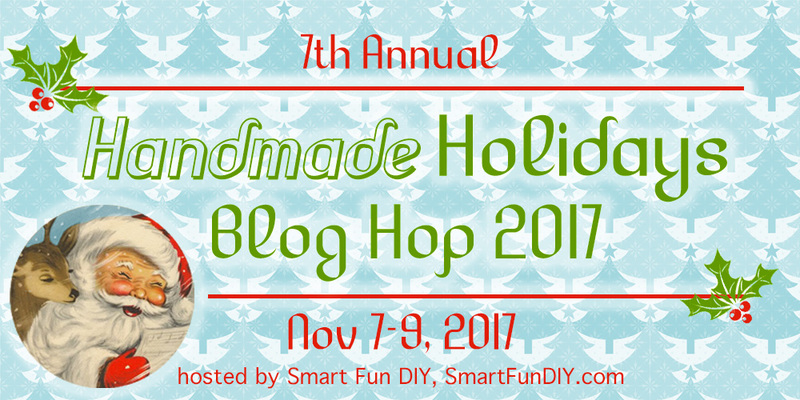 I’m so excited to be part of the Handmade Holidays Blog Hop again this year. 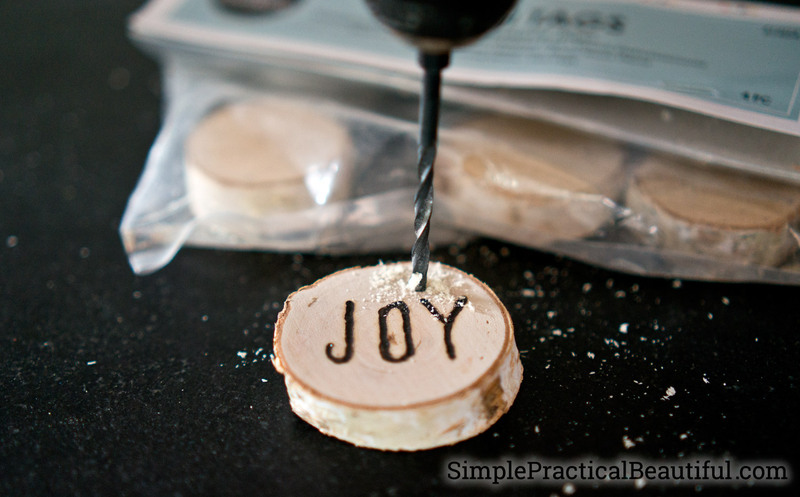 I get so many DIY gift ideas from my blogging friend’s posts. Be sure to check out all of the links at the bottom of this post to find handmade gift ideas for everyone on your list. And come back Thursday for even more! I started with a simple cutting board that I found at the dollar store. But if you’re having trouble finding a nice cutting board to decorate, Walnut Hollow sells several different shapes and sizes. Walnut Hollow gave me a wood burning tool to create this project. Since this was my first time using a wood burning tool, I spent A LOT of time practicing and trying out different tips on scrap wood. Each tip burns a little differently and it takes time to learn to use them effectively. I originally planned to burned a detailed image of parsley into the cutting board, but that was too advanced for me. Instead, I used a simpler image of a rosemary sprig. 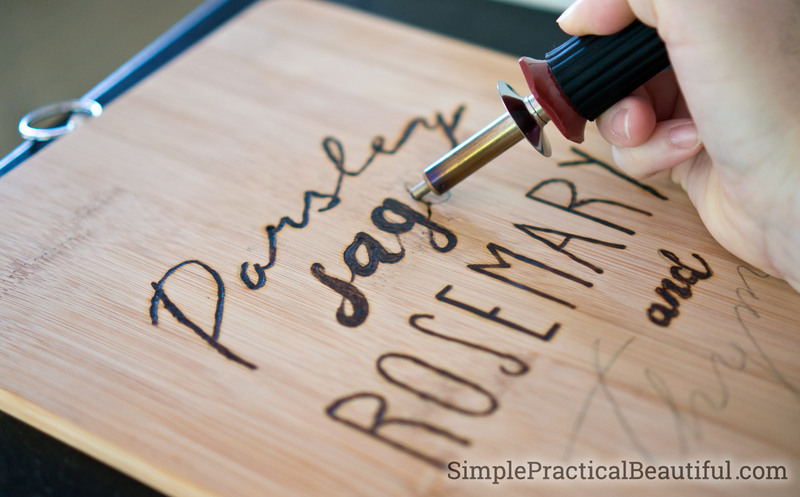 It still took a lot of trial and error to get my wood burning tool to create what I wanted. On the back of the cutting board I burned the phrase “parsley, sage, rosemary, and thyme.” That way the cutting board can be display at kitchen art too. And it looks really impressive in the gift basket. If you want to use the same image, you can download a free printable of it here. Decorating with a wood burning tool was a lot of fun, and eventually I plan to make a video showing how. But first I need to get better at it so that I can use both a video camera and the wood burning tool at the same time. 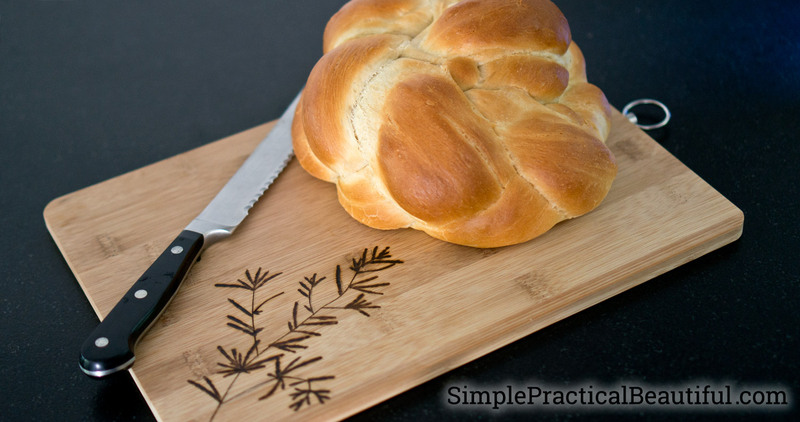 A cutting board can be used without any prep work. The raw wood is naturally antibacterial and makes a great cutting surface, even burned. However, the cutting board will last longer and wear better with a coat of food-safe oil. I also think the oil gives the wood a nice-looking finish. I used food-safe mineral oil. Simply put a small amount of oil on a rag or a napkin and wipe it all over the cutting board. Use a clean rag or napkin to wipe off any excess oil. Linen is the best way to store bread. It keep the crust nice and crispy and the inside wonderfully soft. And sewing a bread bag out of linen is really simple, so I made a video to show how to make one. In the video, I use a sewing machine, but you could easily sew a bread bag by hand since the stitches don’t need to be really close together. The Creative VersaTool can be use on so many different surfaces besides wood. The possibilities are endless. So I decided to use it to decorate my bread bag too. 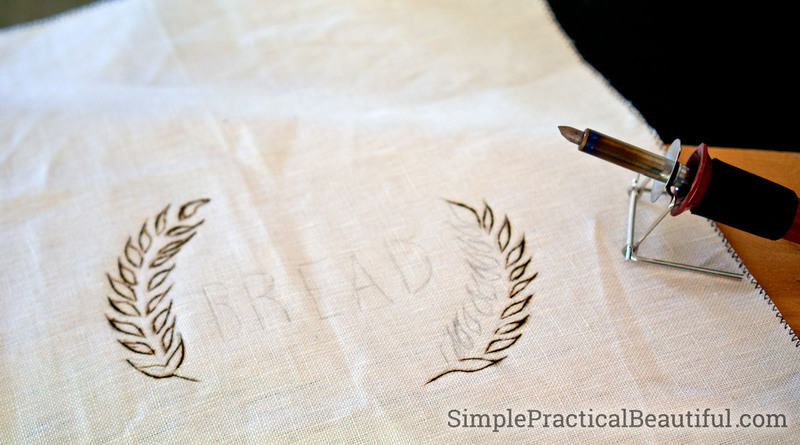 After cutting out the fabric, and before sewing it all together, I added a design to my linen bread bag. Linen fabric burns especially well because it can take a lot of heat. I drew a pattern that I liked on a pieces of paper, then outlined it in black. I put the paper under the linen and traced it onto the fabric. Linen has a very large weave, so I could see the paper below the fabric. Then I set the wood burning tool on high, put my fabric on an old piece of wood, and slowly burned on the design. Fabric is a little trickier than wood. The fabrics moves a lot more easily. But just like wood, I found that going slowly and always pulling the wood burning tool toward myself worked the best. Again, I practiced a lot. My gift basket includes homemade challah bread and whipped herb butter, but you’ll have to stop back on Thursday to see how I made those. (It’s really easy!) And you’ll get lots of other food gift ideas that day too because it’s also part of the Handmade Holidays Blog Hop. I wanted to add a decorative touch to my gift basket, so I also got a birch tag from Walnut Hollow. It’s a cute little circle cut from a birch branch, and it looks rustic and elegant at the same time. I burned a simple Christmas word into the tag. Then drilled a hole through it. And hung it on the top of my basket just below the ribbon. 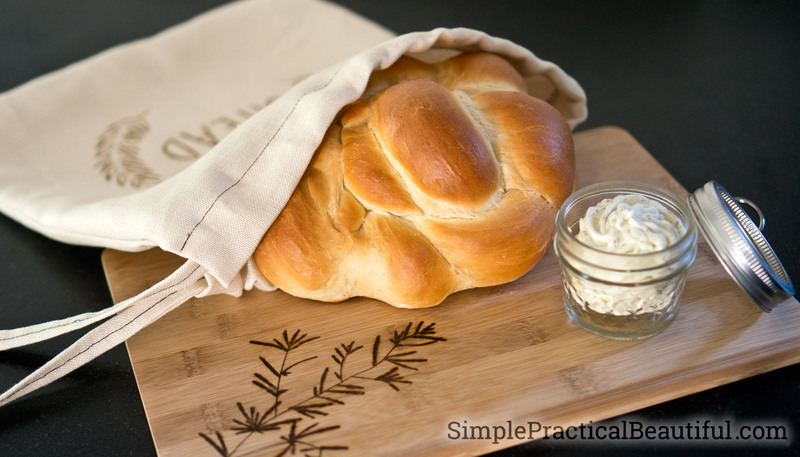 I wrapped my challah bread up in the bread bag, slipped the cutting board in behind it, and added a jar of whipped herb butter with a bow on top. You can’t tell by looking at it, but the whole thing smells wonderful. Fresh bread, herbs in the butter, and even a hint of burnt wood give this gift basket a wonderful aroma. Like this handmade idea? Subscribe to our email newsletter for more! 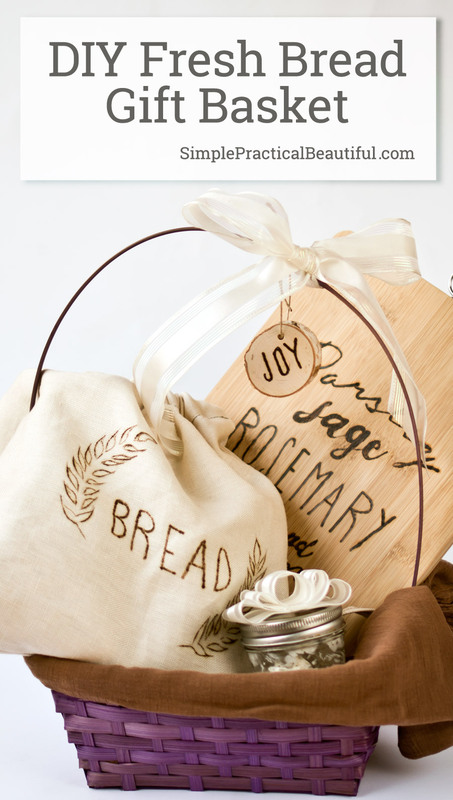 Don’t forget to take a look at all of the other creative DIY gift ideas below. 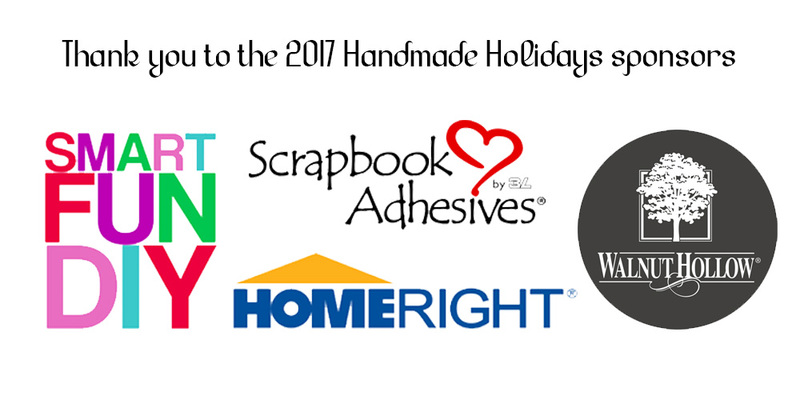 I especially want to thank Walnut Hollow, HomeRight, and Scrapbook Adhesives for sponsoring this blog hop. And don’t forget to come back on Thursday for more gift ideas, this time with food. This is fabulous! You’d never know this was your first time with the wood burner, you’re a pro! I’ve never burned fabric before, that turned out really neat. Amazing idea! Thank you! I had a lot of fun playing with the wood burner. And I love how it looks on the fabric. I can’t wait to try it on other materials. Thank you, Chelsea! It was fun to make all those little details. Wonderful gift idea. I never thought about wood burning linen. Thank you! The Creative VersaTool apparently works on all sorts of materials. I can’t wait to try it out on more. I can think of more than a few people that I know who would love this! Thanks so much for sharing. Thank you! I think, especially with the yummy butter and bread, lots of people would like it. Great gift! Love my carbs!! Visiting from Handmade Holidays. Thanks, Victoria. Carbs and the holidays just go together, right?! I love that cutting board! You definitely have me interesting in trying wood burning. Thanks, Patti. It was a lot of fun. I’m trying to think of more ideas with wood burning that I can give for Christmas gifts. Oh my! I’m not sure what part I like the best about this gift set…the bag is lovely, and that design on the cutting board? Beautiful!! I’m a sucker for wood slices too. You know, I have a wood burning tool I got last Christmas that I haven’t gotten out yet…just haven’t found the right project. I think I’ll have to try this! Thank you so much Meredith! Get out your wood burning tool and a some scrap wood. It’s so much fun to play with. What a beautiful gift set. I never thought about using the wood burning tool on fabric, but it’s look awesome. Thanks, Pam. I know! I’m excited to see what other surfaces I can use the wood burning tool on. That is such a pretty and thoughtful gift! That wood burning tool looks like fun too. I need one now. Thanks for sharing with our link party! Thanks, Stephanie. It is a lot of fun. And thanks for hosting a great link party! I just got a wood burning tool today because I want to make some homemade presents for my boyfriend. I loved your idea!! Adorable idea, I just love it! 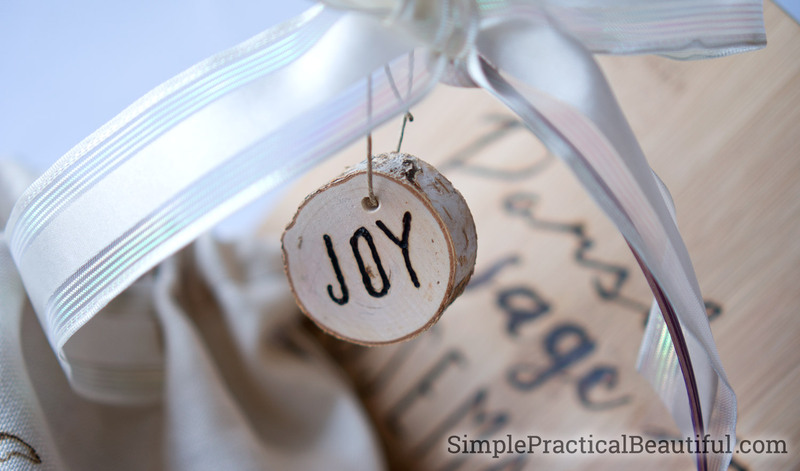 It is such a beautiful and crafty gift idea.